It can be a challenge to plan and execute a successful birthday celebration for your child. This guide contains 6th birthday party ideas for boys. I need some ideas for my soon to be 6 year old's birthday party. I was just going to have a family get together but he wants a birthday party. We are new to this area (1.5 months) so I am not that familiar with the kids in his class and the ones I have met are "rowdy". I am unsure what to do. It is usually snowing here so outdoors is out of the question. I have a small house so that is out too. I can get a large birthday room for free "yay" so that is not a problem. What kind of theme should I use? What games and how many should I plan for? How many children should I invite? Should it be a boys only or the whole class? A friend suggested a sleepover, but I feel he is too young for that. We live a rural area too so if a little one got upset, it takes a while to travel here. He loves the outdoors (deer, ATV's, etc) and he loves Army men, go figure! I am alone on this project as I have no friends here to help me out. The last party was a disaster, the parents did not watch their children and I was all alone trying to wrangle 15 little ones ages 3-4. Not fun, I couldn't enjoy my son. Any ideas, suggestions, comments would be helpful. His birthday is Jan. 27th! Last year we had a zoo/jungle theme party for my 5 year old. I took crepe paper and "toilet papered" my entire living room ceiling to look like a jungle. My neighbor brought over two snakes (my one time allowance, ever!.........You could get blow up animals at the dollar store and hang them from your "vines.") I took pictures from a coloring book, shrunk them down and glued them onto very small gift bags. They served as goody bags. I had crayons and the kids each colored their own bag at the beginning of the party, it was kind of an ice breaker. we had a monkey pinata, played pin the tail on the tiger. My sister-in-law did an ice cream bar, and that went over well. We also bought a little cotton candy machine and had cotton candy and popcorn, with hot dogs. Everyone had a blast. A couple of hours should be all you need, and as long as you keep moving to the next activity (even if it's not going the way you planned it in your head) it should go well. Good Luck! I hope this helps. Love this idea! Thumbs up! Anyone have ideas for a boy's 6th birthday party? I can't do it at home because we are living with the in-laws. We live in Sydney Australia in the eastern suburbs. I need some ideas for my soon to be 6 year old's birthday party. I was just going to have a family get together, but he wants a birthday party. We are new to this area (1.5 months) so I am not that familiar with the kids in his class and the ones I have met are "rowdy". I am unsure what to do. A friend suggested a sleepover, but I feel he is too young for that. We live in a rural area too, so if a little one got upset, it takes a while to travel here. He loves the outdoors (deer, ATV's, etc.) and he loves Army men, go figure! I am alone on this project as I have no friends here to help me out. The last party was a disaster, the parents did not watch their children and I was all alone trying to wrangle 15 little ones, ages 3-4. Not fun, I couldn't enjoy my son. I am the queen of parties! I love parties! 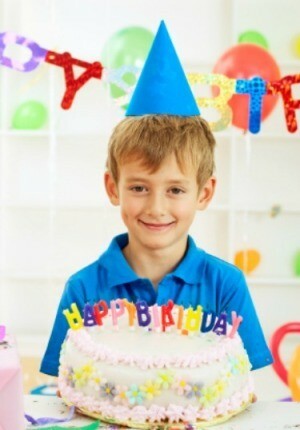 You can get lots of cool ideas from http://www.birthdaypartyideas.com. If you really want to enjoy your son's party along with him you may want to consider inviting no more than 6 friends. I read somewhere that a good rule of thumb is one guest for each year of your child's age. Six kids is manageable without their parents. If you are going to invite the whole class maybe you could suggest that the parents stay also. It would be twice the cake for half the headaches. I recently taught my 4, 5, and 6 year old grandchildren to play some kids' card games and they loved it. They now play with each other, and want to play in the evening before bed (instead of watching television, yeah!). How about inviting parents to stay and having a "card" party, with an adult at each playing area, playing too? Kids seem to love having the attention of an adult. You could play kids card games, "Slap Jack", Crazy Eights, or any child's card game, then give each of the kids their own card game to take home with them. They're very inexpensive and might even be found at the Dollar Store near you. You could have them play as a tournament, 6 year old boys are quite competitive, to see who gets to be "King of the (SlapJack) Hill." I adhere to the one child per age rule for birthdays (my kids are April and Sept.) and then we have an invite everyone party outdoors in the park in nicer weather. If you go with the army man theme, try doing a boot camp modified for your living room (or garage if possible). String ropes across the room 12" off the floor for a "mud crawl" on their bellies, walls/boxes to climb over. Have a magnetic dart firing range (you could use cookie sheets with sticker targets and kitchen magnets if you don't have a dart set) or a bean bag toss made with holes in a box (painted with camouflage of course - good prep job for your son to do) and old socks filled with rice. Stomp the balloons (or bubble wrap sheets) with stickers inside each balloon, but no grabbing stickers until all balloons are popped and "clean up" reveals them on the floor. Decorate a helmet made from empty ice cream cartons (not just round but rectangular too), follow the leader marching exercises (while singing marching jodies you could make up ahead of time "Your right, your right, your right, left, right" type of thing. Who said kids shouldn't learn at a party!). Also try a treasure hunt with packing peanuts in an old wading pool or cardboard box with goodies scattered under the peanuts (plastic soldiers, stickers, pencils, cards, etc.). I have 3 boys, and they love parties! At the age of 6, it seems as though the girls don't really "bug" them, but they tend to have a lot more fun without the girls. I've done everything imaginable at my house, turned it into every boys theme you can think of, but the one I find to be the easiest in a small space or a birthday party room, is (jungle theme) which may fit nicely into the Army ideas. It is very easy to find jungle/animal games and prizes. 6 year olds love prizes no matter what they are, and you can generally find great things at the $1 store that are big and exciting for them. I like the indoor fishing pond, with a small blow up swimming pool and a fishing pole, each child gets something, dancing to music with balloons, keeping them off the ground, and clothes pin in a bottle. I came to this site to get some ideas for my son's birthday party, which I did, but I did not see the one I am doing mentioned, so here goes another idea! I also thought 6 was a little young for sleepovers, so we decided to have a "pretend" sleepover. The boys will come dressed in their p.j.s and we are going to play games like slipper toss in which the kids can go one by one or be split into teams and they have to toss a slipper (or both) into a bucket from whatever distance away you choose; freeze dance; face painting by his older sister; and maybe a magic show by the neighbor's 11 yr. old boy. When my daughter had a sleepover party we decorated pillowcases with glow-in-the-dark paints and the kids loved them! You can also buy all the G-I-D items for them to take home. Also, you can buy popcorn bags to use as the kids goody bags or just fill them with popcorn! GAMES: Go on the web and search for some games or just play hide and seek, mummy wrap, treasure hunts, or "What time is it Mr. wolf?". Boys usually like to run around and have fun; so plan some relay races, or let them play volley ball or just toss a ball, play soccer, kids tennis, some board games, or maybe hire a magician to come and do some magic tricks for them. I did that once it was so cool! FOOD: Just order some pizza or have a bbq hot dogs, salad, anything! GUESTS: I think you should let your son decide who he wants to invite. Show him a picture of his class and let him point to who he wants to invite. Since he is a boy there are probably going to be more boys than girls. And make sure you are comfortable with who he invites too! Oh yeah and one more thing, have fun! Third party locations are always the best because there cannot be hard feelings over spilled foods/damage/mess, etc. in your home. Standards for children's behavior differ greatly from family to family! You also need worry less about "rowdy" kids and there is less overall clean up. And when the party is over; it's over. The more the merrier. Consider how you would like to handle siblings of primary invitees and make your policy clear to RSVP'ers. If your child will be inviting kids from group settings like the classroom, ball team, scout group, etc., please consider inviting all the kids. Avoid the great deal of hurt feelings on the part of both parents and kids, and it goes from the very young all through early teens! Many people will not be able to come due to their own family commitments. It is highly unlikely that they will all come, but the inclusive invitation will make a positive statement about you and your child. Also please consider food allergies and ask RSVP'ers if they have food allergies. It may seem inconvenient to you, but a child in allergy shock will put a damper on your party (not to mention the sad child!). Again the thoughtfulness will go a long way with the other parents! Finally the ever expensive "goody bag". Consider giving an age appropriate fun book to each child with a note inside the cover saying "Thank you for coming to share my fun. ", or some such. Books for children can be purchased inexpensively if you make some phone calls and browse the internet. Wrap each and let the children "grab bag" them on the way out of the party. The parents won't have to throw it away and will appreciate the lack of candy/disposable junk and your thoughtfulness! Also if you want parents to stay and supervise their own children please make that clear on the invitation and then again with RSVP'ers. There are nice ways of saying this too. Consider wording like "Come enjoy the party with your child please." Have a great party and keep your camera handy!